Feel like boosting school/work morale or adding some fun in the work place? Create a Secret Pal at work for 6-12 months! 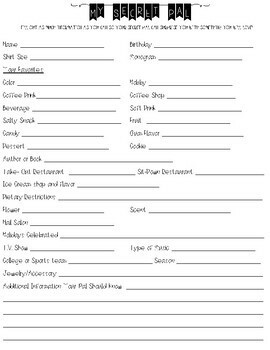 Place a Secret Pal Questionnaire in staff mailboxes/desk, ask for a return date and place envelope for staff as you collect. Redistribute to staff members and encourage staff to surprise their Secret Pal as often (once a month and less than $5 can be encouraged).